I love my grandfather, the dear man as old as Methuselah. I'm not entirely sure just how old he is, but he's quite ancient. The family teases that he must be preserved in formaldehyde. Perhaps, in all his scientific tinkering, he had discovered the secret of longevity, longevity if not a completely sound body. He still works in his old antique clock shop. His son, my uncle, who is past retirement age himself, works there too, as does my cousin. 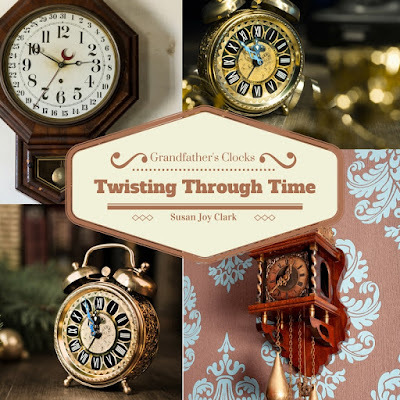 Like his old clocks, Grandpa might need some winding up, but he keeps going. Grandpa's always been a bit eccentric, full of wild theories and ideas and wild inventions that never quite get off the ground, but the latest reports were wilder than usual. It was a shame, but it certainly seemed that Alzheimer's had finally struck. Lately, the stories Grandpa told me over the phone were peculiar to say the least, like stories of having tea with Queen Elizabeth. It would have been strange enough if he had claimed he had visited Buckingham Palace, met with the queen for a spot of tea and petted all the Corgis, but he didn't even mean Queen Elizabeth II. He meant the first. He also claimed to have gone swimming with Winston Churchill and that Churchill liked to skinnydip and looked just like a manatee in the waves. As far as everyone knew, the old man hadn't left the country – the U.S., that is – never mind left the decade … or the century. The only thing that seemed to have taken off anywhere was his senses. I decided I needed to go see him, to persuade him to wind down and take a rest. The clock shop was always a wonderful and confusing overload of my senses. There were mantel clocks of ornately carved wood, grandiose clocks with miniature brass sculptures of mounted warriors, bronze Rococo clocks with ostentatious confusion of sculpted swirls, Bavarian cuckoo clocks with delightful figures that popped out of miniature doors, and in between all the tick tocking, there were cacophonous bursts of chimes and bells and cuckoos. “Take a nap.” This wasn't exactly the subtle approach to suggesting rest that I had intended to make. “Well, even great minds need to rest sometimes. That's how they go on being great minds.” Perhaps I had redeemed myself just a little. Grandpa had a sort of personal nook in a corner of his shop, with a couple of stuffed chairs facing the door, books on antiques and an electric hot water pot. I sat down in a chair with sculpted wooden arms. “Oh, just wait 'til I tell you,” said Grandpa. “It's quite wonderful. So, there I was …” Grandpa remained standing and spun slowly in a kind of confused dither. “Ah. Look at this.” He pulled an old herringbone tweed golf cap from a nearby hat rack and sat down. “It's a hat,” I said. On closer inspection, I said, “It's a hat with a hole in it.” There was a small hole through the center of the hat. Apparently, there were some parameters to my grandfather's madness. I didn't want to sit and twiddle my thumbs while these two talked, so I decided to get up and wander up to the upper level, ascending the creaky wooden stairs to my left. The upper level had no clocks, but, instead, interesting examples of antique clockwork, automata, elaborate mechanical toys. I was fascinated with a rather large piece in one corner with twirling, waltzing couples. The figures were nearly two feet tall. It was dizzying after a while standing still and watching them twirl in circles. I turned my back to them and was face to face with a full-length mirror. Watching the twirling reflections in the mirror was no less dizzying. I thought I heard a noise and turned. As I did, my heart nearly leaped into my throat. There, standing between me and the twirling figures, was a man, at least what seemed like a man. He could have been a mannequin in antique Victorian dress, only mannequins don't just move themselves and plant themselves in new spots. Partly because I was startled, and partly because I was doubting my senses, I felt no obligation to be polite and turned my back to him once more. Strange, but there was no reflection in the mirror of a man behind me. I turned again to face behind me, and there stood my Victorian gentleman. Like one of the twirling waltzing figures, I turned to the mirror again. There was no reflection of any Victorian gentleman in the mirror. “They say madness runs in families ...” I muttered aloud.